So Rap Genius is a website where people post lyrics to songs. It’s done community style, and you can add annotations to explain/question the meaning of lyrics. There are options to buy tracks and watch YouTube clips of the songs. Here’s an example. I’m writing about this, because I’m always interested in ways to make a living in music outside of making music. This kind of falls into that bucket. Rap Genius got a lot of attention because they got a lot of traffic, which turned into money from investors (lots of it). They kind of fit into the same online boat as sites like Twitter (pre IPO version) or SnapChat. They have a lot of users and data and a somewhat unique idea – so investors love to imagine how that could turn into lots and lots of revenue1. You see, in the online world, it’s really really tough to compete without advertising. If you are a successful website that doesn’t use ads to bring in visitors, you’ve either got such an amazing product/idea that people can’t help but share it – or you’re doing something shady. Rap Genius falls into the latter group. This is a really dumbed down explanation, but here’s the basics: Search engines use a lot of factors to determine what sites show up toward the top of the results for a given search. The biggest of those factors is links. If a lot of people link to your site, it’s like a vote of confidence. People are saying that your site is good. Google and friends count those links and use them to create a score for you. If sites that have a lot of links themselves are linking to you, even better. Over the years, lots of people have reverse-engineered this ranking system to some degree and abused the system. They paid for sites to give links, they created fake websites that only existed for linking. Stuff like that. That’s what Rap Genius did. Google hates when people do this2 because it means the best result isn’t necessarily showing up first, it’s just the one that gamed the system the most. That means people searching might dislike the results and stop using Google, which means loss in precious ad revenue. So it’s in Google’s best interest to punish people who really grossly abuse the system. It’s one thing not to show up for “justin bieber lyrics” – but not to show up for your own trademark? Bad news. Though any links to our tracks that our fans put on their pages were editorially placed or vouched for by them, in some instances we have fallen short in terms of making sure that the links people post are natural. You mean to tell me that Home Depot is not even 5x as popular as some tiny startup? I know it’s the web, but that just looks fishy. Rap Genius got super relevant blog links from sites like LocomotiveDesign.com (over 6,000 links), CeleBraPics.com (1,000 links) and my favorite, GangstasUseEmoticons.com (over 85,000 links). Those are a very small handful of examples. Yes, stupid links like those happen to all sorts of sites by accident, but not by the hundreds of thousands or millions. Not without money changing hands. They point out in their defense letter that the other major lyrics sites are doing way more shady tactics. They’re right. That doesn’t make them innocent, though. 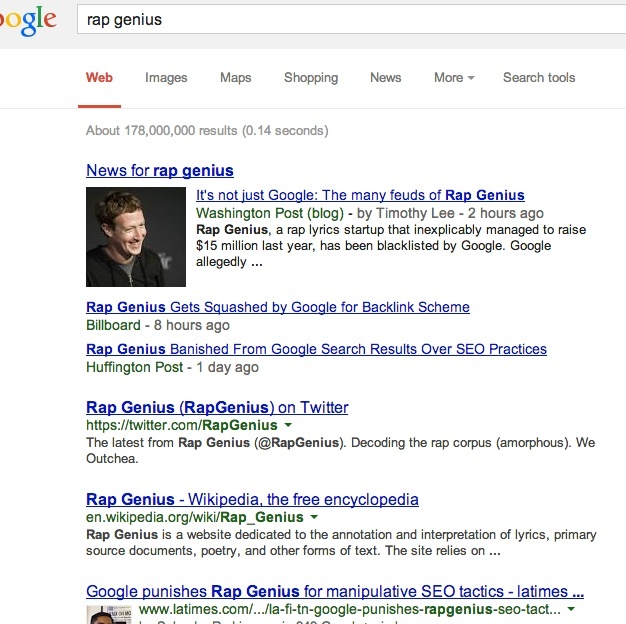 More than likely, Google is making an example of Rap Genius because they’re a very visible company in the US and the other sites are probably run by some 13 year old kid in China. I could go on and on, but this has gotten carried away enough with the online marketing talk. That’s not really the point. The point is, to wonder what this means for the music world. Certainly, there’s no loss to people searching for song lyrics. Maybe Rap Genius has a better platform, but still, there’s no shortage of options out there for that sort of information. But for someone passionate about music who wants to make a career somehow tied into music? This kind of paints a bleak picture. Is a website like this even a viable business option? Even great ideas can’t always spread in a viral fashion, so that means to legitimately grow an audience you need to advertise. Just like in the real world, this can be a nearly impossible expense after all the investment of turning your idea into a business. Not to mention, nobody really likes looking at advertising online3. That complex landscape might mean that a lot of great ideas never become reality. It might mean a lot of bright people in the wider music community end up in law school instead. It may sound a little silly or extreme, but think about Daft Paragon or any number of small websites like it. I am trying to make some money here;4 with no ad budget, I need to rely completely on social sharing and organic search. I don’t do much to grow this beyond writing semi-regularly… But if someday I really wanted to push this site to grow, am I going to have to fear the wrath of Google? To try and get noticed alongside the likes of Guitar World, will I be forced to follow a path somewhat similar to Rap Genius? It sure doesn’t seem like a viable option. And with costs steadily climbing, a linear traffic growth can almost be to the detriment of the site. A lot of very small businesses face this. Gradual growth can be deadly. Costs keep climbing, but revenue doesn’t jump enough to afford you extra staff or infrastructure. So you need to find a way to make a big jump in cash flow. In this business, it means a lot if traffic. In a crowded internet, no matter how good your ideas are, you need to find a way to get the attention of millions of people and hope that some of them remember you. You need to do this in a hurry, because up front development costs can be crippling. In the murky world of online marketing, this means doing things to get noticed that might not seem morally right. The tactics that fit the virtuous path laid out by Google often don’t work. So you try to find a balance of the two. That was Rap Genius’ plan. Let’s face it, Rap Genius doesn’t offer a life-changing product. But it’s still an idea. An idea built around people sharing their love of music. It’s a good idea. Is it a solid investment? Probably not. But should it potentially allow a few people to make a career? Absolutely. They cheated and got busted. It’s going to be really hard for them to recover. Maybe impossible. Their dream might be dead. Is it fair for Google to control their fate like this? Will this widely publicized story prevent other entrepreneurs from pursuing their own dreams online?